File photo of annual Amphibious Operations (AMPHOPS) during the annual Foal Eagle exercises against a possible attack from North Korea, in Pohang, 360 km southeast of Seoul, South Korea, 02 April 2017. South Korean and US military Combined Forces Command is holding the annual Foal Eagle exercises from 01 March to 01 May 2017. File photo by EPA/Jeon Heon-kyun. South Korean and the United States began their delayed joint military training on Sunday, mobilizing more than 300,000 troops. 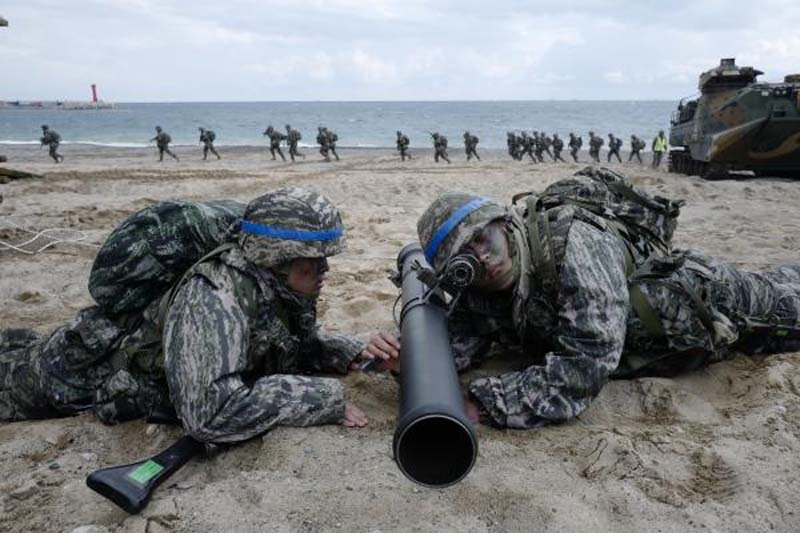 Seoul's defense ministry said the springtime Foal Eagle kicked off with 11,500 U.S. troops and 300,000 South Korean soldiers taking part in the field training exercise, one of the largest military drills conducted annually in the world, SBS reported. [post_ads]The exercise, which usually takes place late February or early March, was postponed this year to avoid an overlap with the Pyeongchang Winter Olympic and Paralympic Games held from February to March in South Korea. President Moon Jae-in had requested the delay, in hopes of defusing tensions with North Korea, which has long seen the games as a rehearsal for war and used them as a pretext for provocations. With cross-border relations appearing to improve as the two Koreas head to summit talks slated for later this month, observers have said the South Korea-U.S. drills have been notably scaled down this year. The two-month long Foal Eagle exercise has been reduced to a four-week run with no major U.S. strategic assets such as supercarriers or nuclear submarines expected to be deployed to the peninsula, Yonhap reported. However, authorities have denied the drill will be low-key compared to previous years, saying there is no change in the number of troops, the program or the intensity of the exercise. From April 23, the two allies will also begin the computer simulated Key Resolve games for two weeks, involving 12,200 U.S. troops and 10,000 South Korean soldiers.